Space-based lasers could allow for interstellar missions by focusing beams on immense lightweight solar sails, allowing a spacecraft to reach enormous speeds. A milestone making space mission is, quite factually, ready to set sail. The privately sponsored Cosmos-1 solar sail is to fly into Earth orbit courtesy of a boost from a Russian Volna rocket, deployed from a Russian nuclear submarine positioned in the Barents Sea. The submarine-launched rocket, carrying the solar sail is targeted for liftoff on June 21 at 3:46 p.m. EDT. The Volna rocket being tapped to toss Cosmos 1 into a roughly 500 mile (800 kilometer) circular, near polar orbit is a converted ballistic missile of the type once armed and aimed at the United States. Cosmos 1's flight is viewed as a stepping stone in developing future solar sail technologies. Solar sailing has been a long sought technology that could lead to future interstellar flight. The solar sailing craft is a project of The Planetary Society, a public space advocacy group headquartered in Pasadena, California. The effort is also sponsored by Cosmos Studios, a science-based entertainment company located in Ithaca, New York. Cosmos 1 was built by the Lavochkin Association and the Space Research Institute of the Russian Academy of Sciences in Russia. Cost of the project is in the range of $4 million. A solar sail is pushed directly by photons, light particles from the Sun, reflecting off sets of large mirror-like sails. 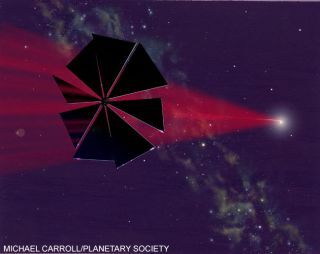 Because a solar sail carries no fuel and keeps accelerating over almost unlimited distances, it is a technology often pointed to that can propel interstellar travel into reality. Reflected light pressure will push against Cosmos 1's eight reflective blades, designed to adjust to the continuously changing orbital energy and spacecraft velocity. Cosmos 1 will be the first attempt to sail under sunlight pressure. Reached in Moscow, Louis Friedman, Executive Director of The Planetary Society told SPACE.com: "Everything seems set, both with our spacecraft--on the rocket on the submarine--and with our plans for launch and operations." Friedman said that everyone is excited and proud to have reached a point of launching the solar sail, "and a lot of nervousness about the mission." "We feel that we have done well, building and delivering this spacecraft, considering the very low project budget," Friedman said. "There is certainly high risk...but I have to say this team of folks in Russia is extremely professional and competent, and have put a lot of their own effort into it. Our team in the U.S. is also excellent. All of us...Russians and Americans...are looking forward with high hopes, and of course high anxiety, to a great week in orbit," he said. Friedman said that the solar sail effort is a great venture that will stand up positively whatever happens this week. "The payoff will be seeing that sail deployed," he said. "By Monday, everybody involved will be in their places for the launch. We're almost there," advised Emily Lakdawalla, Project Operations Assistant and Image Processing Coordinator for Cosmos 1 on the mission's web site. A global-wide group of ground observers are ready to keep an eye and ear on Cosmos 1 once in Earth orbit. The mission will be controlled from the Lavochkin Association in Moscow. A project operations center will be located at The Planetary Society in Pasadena. Early indication of how Cosmos 1 is doing will come from the United States Air Force Maui Optical and Supercomputing Site (AMOS) in Hawaii. It will attempt to image the sail as soon as possible after deployment. An experiment to accelerate Cosmos 1 with a microwave beam from Earth will be conducted during a later stage of the mission, making use of a NASA Deep Space Network radar antenna. The Planetary Society must approve the activation of the experiment and will do so only after the prime mission objective of controlled solar sail flight is achieved. Cosmos 1 will be tracked from the ground through its radio system and on-board Global Positioning System (GPS) hardware, as well as a micro-accelerometer. With sails unfurled, Cosmos 1 will be bright enough to be easily visible to the naked eye.